It's the perfect time of year for warm, fuzzy accessories! 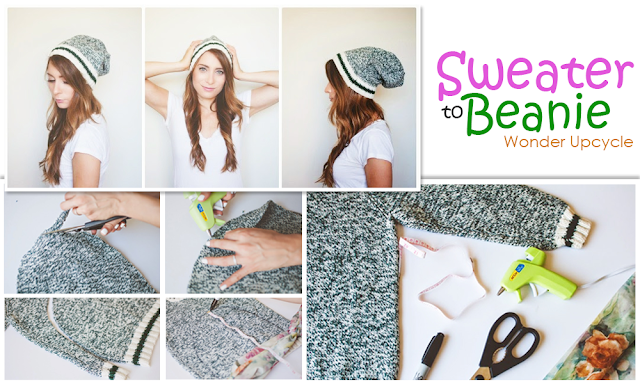 I love scarves, mittens and snow hats, but did you know you can make them yourself from an old sweater? Today I'll show you how to recycle a sweater into something brand new! Step 1: Use the hemline on your sweater as the hemline for your new piece. For example, since we are making a hat today I am using the bottom of this sweater, which already has a pretty finished hem! Step 2: Mark off the area that you want to sew with chalk or a marker. Your sweater should be turned inside out. I used a hat I already have to measure the pattern for my new hat. Remember, it's better to make it a little bit too big, you can always size it down later! Step 3: Stitch your shape on your sewing machine. We used a 3.5-inch stitch length for this sweater, which is a medium weight sweater. Remember to sew before you cut the knit fabric. Step 4: Cut your hat out. Try it on. Stitch it smaller if it's too big (we did this a couple times!). Enjoy your new fuzzy hat and add a yarn pompom if you like! Turn it inside out and it's done! 1. Always use the existing hem, if you can! 2. Give yourself extra seam allowance, it's easier to size down than to size up. 3. Always sew before you cut the knit fabric! 4. Start with basic shapes like a hat or scarf before you try something more complicated! 5. Thinner knits are easier to sew with a machine. 6. If you need to cut your sweater before sewing, baste the edges of the garment before you cut. 7. Chunkier knits need a bigger stitch length. 8. Try adding hand stitched details with yarn. It's so much fun! Have fun stitching something from a knit sweater!